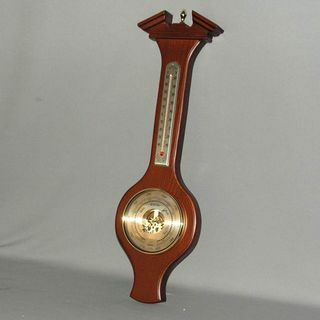 Barometer/Hygrometer & Thermometer set into a beautiful full size mahogany-stain wood base in the classic (banjo) manner. Measures 60 x 16 x 4cm and hangs on the wall in all its elegant beauty. 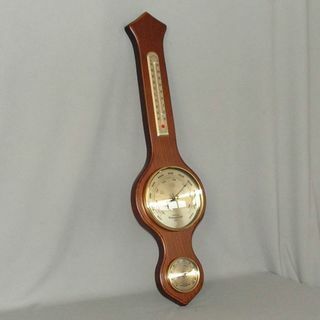 Full size Barometer/Hygrometer & Thermometer set into a beautiful full size rimu-stain wood base in the classic (banjo) manner. A customer has advised that the current colour of the stain is more of an orange than that shown in the image here. 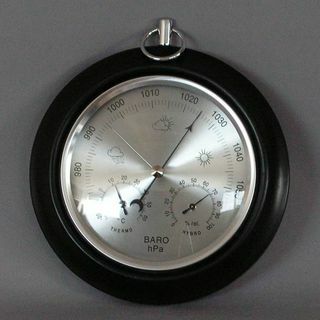 Full size Barometer/Hygrometer & Thermometer set into a beautiful full size black-stain wood base in the classic (banjo) manner. 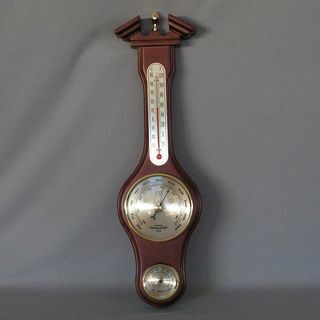 Barometer/Hygrometer & Thermometer set into a beautiful mahogany-stain wood base in a modern version of the classic manner. Will be freighted directly to you via Toll freighters from the exclusive importer. 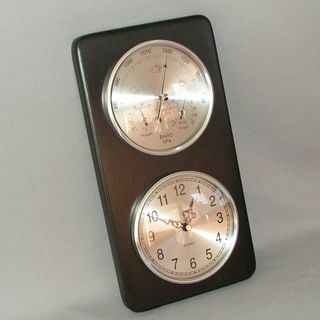 Barometer/Hygrometer & Thermometer set into a beautiful rimu-stain wood base in a modern version of the classic manner. 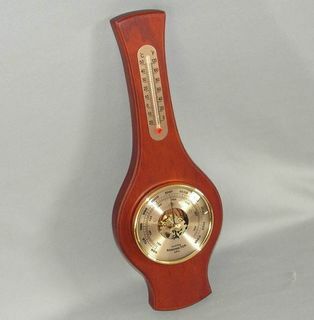 Barometer & Thermometer set into a beautiful full size rimu-stain wood base in the classic manner. Cutaway in the dial centre shows the operation of the barometric chamber. Also shows the current ambient temperature (on the thermometer). Measures 49 x 12 x 4cm and hangs on the wall in all its elegant beauty. 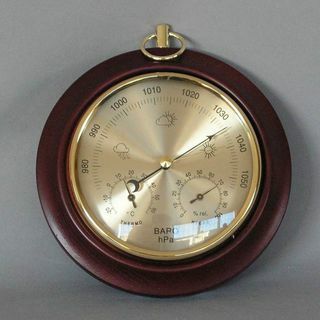 Barometer and Thermometer set into a beautiful full size mahogany-stain wood base in the classic manner. 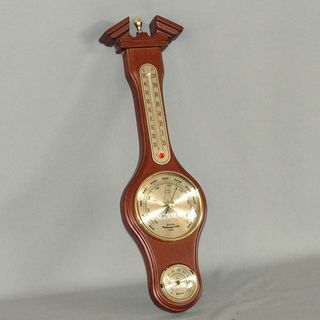 Barometer & Thermometer set into a beautiful smaller mahogany-stain wood base in the classic manner. Measures 33 x 15 x 4cm and hangs on the wall in all its elegant beauty. 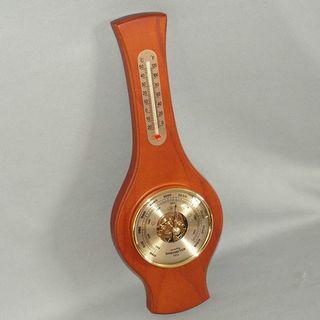 Barometer & Thermometer set into a beautiful smaller rimu-stain wood base in the classic manner. 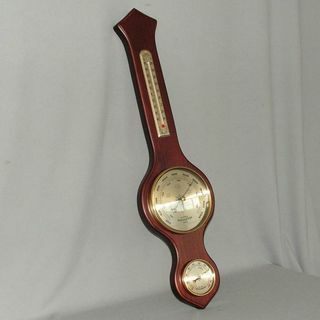 Barometer/Hygrometer & Thermometer set into a beautiful 3/4 size mahogany-stain wood base in the classic manner. Just set the base pointer and tap the glass gently to measure any subtle change in direction to see the weather prediction. Also shows the humidity reading (on the hygrometer) and the current ambient temperature (on the thermometer). Measures 39 x 12 x 4cm and hangs on the wall in all its elegant beauty. 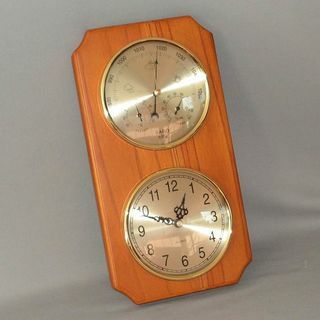 Barometer/Hygrometer & Thermometer set into a beautiful rimu-stain wood base in the classic manner. 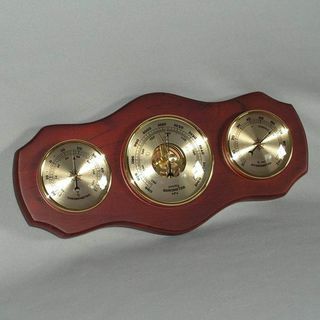 Barometer, Hydrometer & Thermometer set into a beautiful mahogany-stain wood base in a newer horizontal manner. Shows the humidity of the air with a side-mounted hydrometer. Also shows the current ambient temperature on the other side-mounted needle-type thermometer. Measures 31 x 15 x 4cm and hangs horizontally on the wall in all its modern beauty. 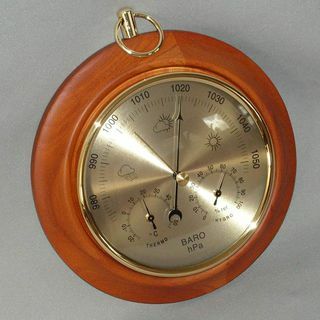 Barometer, Hydrometer & Thermometer set into a beautiful rimu-stain wood base in a newer horizontal manner. 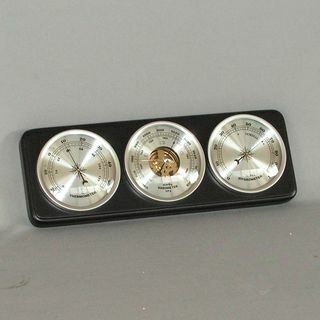 Barometer, Hygrometer & Thermometer set into a beautiful black-stain wood base in a very modern-looking horizontal manner. 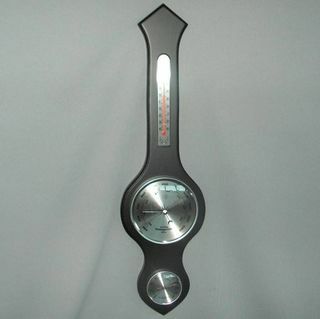 Shows the humidity of the air with a side-mounted hygrometer. Measures 30 x 11 x 4cm and hangs horizontally on the wall in all its modern beauty. 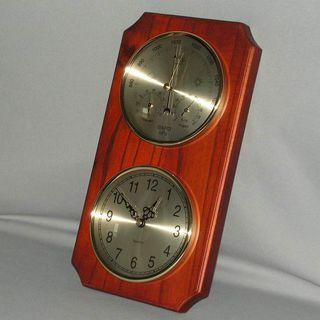 Barometer/Hygrometer/Thermometer set into a beautiful mahogany-stain wood base along with a classic matching clock. 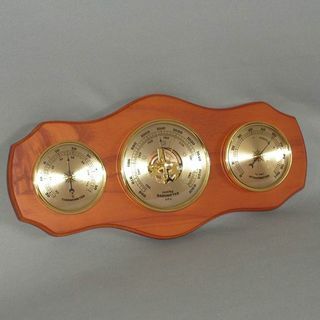 Barometer, Hygrometer & Thermometer set into a beautiful rimu-stain wood base in a very modern-looking horizontal manner.